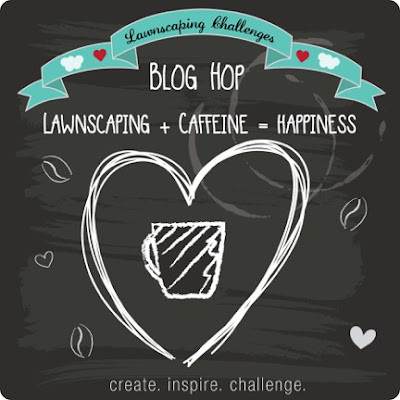 Welcome to the Lawnscaping June Blog Hop, the theme is coffee! I am absolutely delighted to take part with such talented crafters! A big shout out of thanks to the wonderful folks sponsoring the blog hop! We are fortunate to have Lawn Fawn, Ellen Hutson, The Ink Road, Crafters Companion, Spectrum Noir, The Alley Way Stamps, Newtons Nook, Faber Castell, and Right at Home! Lots of sponsors and lots of prizes you can win just by leaving comments on each of the blogs listed below. You have until 11:59 PM EST on June 28th to leave your comments, but please do not copy and paste your comments! All information regarding sponsors, prizes, and how to win can be found on the Lawnscaping Blog. The winners will be announced on the Lawnscaping Blog. And now for my card! To create my card, I used Tag You're It Lawn Cuts and stamps from the Love You a Latte set. The paper is from the Snow Day Petite Paper Pack with a touch of Peppermint Single Cord Lawn Trimmings. Thank you for visiting, enjoy the Hop! This little tags are so cute for this nice card!! I love the result! I love this adorable tag design, Tammy! I like it a latte!!! This is gorgeous Tammy, such a fabulous design. I love the colours and fabulous sentiment. Love the tags on your card - very cute! love how you used tags on your project! They give lots of interest and make the card so unique! Lovely! very happy card! love the fun sentiment! Great use of the tags and love the colors! Super cute card design, Tammy! love the design of your card and the color scheme. Would be a Cute Christmas card too! Awww this is so sweet! Love the tags you used, those would make great bookmarks too! The peppermint cord is so cute! And I have to add a comment about your adorable fur-babies you have on your blog, so cute!!!! I am a fur baby mom too, 2 German Shepherds! (which is why most of my cards have a dog hair or two in them ha ha!) Thanks for sharing your fabulous card with us! Super sweet tag card, love the brown and red combo and the twine! Oh my god! I love love love these colours and the cute red hearts!!! Squee, super card, Tammy! As a huge coffee fan, this just made my heart smile! I don't like coffee, but LOVE your wonderful card! The background in the black and white tiny dots is so pretty with those darling little cups of coffee. Outstanding! Love the multiple tags on the card, love the way it looks. Nicely done! I love the black white and red! Great job! The tags are really cute too! this is fantastic! love the colors and your coloring! Love the tags! So cute. Tag, I'm it, I be over for coffee soon!! I love the tags you have used. Great card. Love your design!!! & all your little hearts! So cute!! 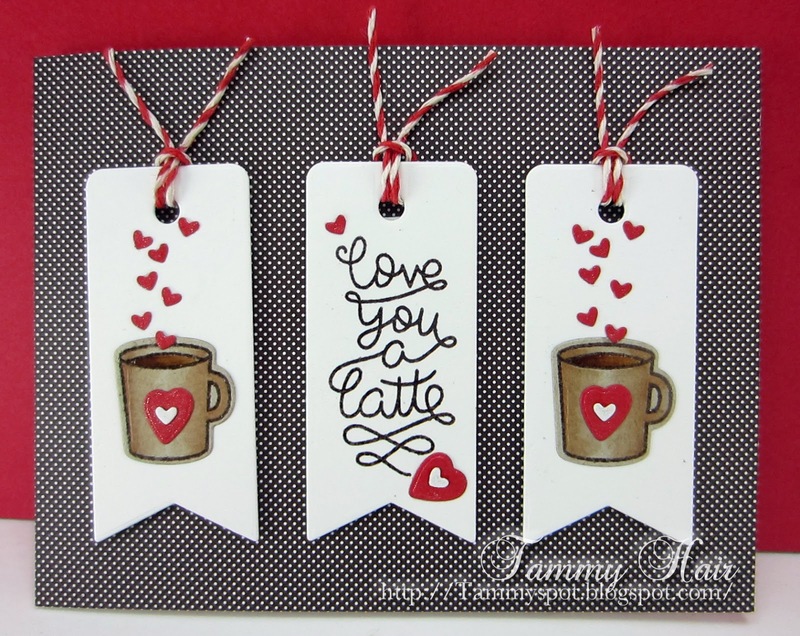 Super cute coffee tags on your card! I became a follower, your cards are all cute! I love the red black and white and the cute little tags! Great card! Your cute little tags really pop against the black and white background! Love this!! Colors are perfect. I love the tags on your card! They really make the images pop! This card is one of my favorites so far ! I love the tags and the colors ! Love the way you used multiple tags on your card, Tammy. Great design and color combination. Oh, and these little hearts steaming from the mugs are just adorable! What a lovely card Tammy :) Great design. Fantastic card. Love the paper. The 3 tags are really cute. Thanks for sharing. Gorgeous and fun card!!!! Love the tags and the colors- perfection! The polka dots are fun. so super cute, love the tags and the great design. This is so clever to use the tag die like this. Fabulous!! Like the trio of banner tags with twine. Love this! Gorgeous tags - the red and white twine is perfect! adorable! im gonna have to try to recreate something similar - im in love with those banner tags!! Great idea with the 3 tags! I love it! I love black, red, and white together. This is so cute. I love the use of tags for cards. And also thank you for the inspiration for new tags too. Cute card! Always love tags on a card - can never go wrong. You can feel the love on your card! Great one! Sectioning the card and using the tags for the sentiments is a great idea. Really works out so well. Love how simple but pretty this card is and that trio of tags is so clever! Dramatic and stunning Tammy! Your card is fabulous! Hard to go wrong with red, white and black....and love the little details on this card....adorable! hey, I have this tag---never thought to use multiples on a card, so cute! What fun, multiple tags on one card!!! And I love the color scheme - so well done!! You have made a perfectly wonderful card!! What a nice card. Love the tags. I never think to repeat an image or tag, like you did. What a fabulous look. Really wonderful card. Love the baker's twine ties. Super cute and I love the triad of tags! Wonderful card!! Love the red/white/black color combo!!!! Love this design with the three mini tags...very sweet. Amazing! I love the layout. I'd want to make one of each tag on it's own too! Pretty pretty! Great job. Very sweet with the tags and all the hearts. Wonderful! Love the little trio of tags! Oh, how adorable is this!! LOVE the tag trio and color combo!! Cute card! Love your fun paper choices! wonderful ... love the hearts on the mugs ... love the fishtail flags ... love the colors ... love the card! Love that mini polka dot background and the color combo is so bold & fabulous! Sweet little card Tammy! Those little tags are just so cute!